Matt Turck, a Managing Director of FirstMark Capital, invests across a broad range of enterprise and consumer startups. Prior to FirstMark, he was a Managing Director at Bloomberg Ventures, the investment and incubation arm of Bloomberg LP, which he helped start. Editor’s note: Matt Turck is a managing director of FirstMark Capital. The frenzy around the Internet of Things (IoT) should be reaching its final countdown. While the Internet of Things will inevitably ride the ups and downs of inflated hype and unmet expectations, at this stage there’s no putting the genie back in the bottle. The IoT is propelled by an exceptional convergence of trends (mobile phone ubiquity, open hardware, big data, the resurrection of AI, cloud computing, 3D printing and crowdfunding). There’s also an element of self-fulfilling prophecy at play, with enterprises, consumers, retailers and the press all equally excited about the possibilities. As a result, the IoT space is now reaching escape velocity. Whether we’re ready for it or not, we’re rapidly evolving toward a world where just about everything will be connected. This has profound implications for society and how we collectively interact with the world around us. Key concerns around privacy and security will need to be addressed. For entrepreneurs, the opportunity is massive. Where Web 1.0-connected computers and their data and Web 2.0-connected people and their data, Web 3.0 is shaping up to be connecting just about everything else — things, plants, livestock, babies. Each new wave has spun out giant companies (Google and Amazon for Web 1.0, Facebook and Twitter for Web 2.0). Will Web 3.0 create a comparable pair of behemoths? The space has been evolving so rapidly over the last year and a half that our IoT landscape became quickly outdated. So we’re presenting a revised and updated version. (As always, and despite our best efforts, a number of great companies will be missing; omissions are completely unintentional). As much as possible, we have tried to put one brand per category — although many companies probably belong to several categories. Finally, categorization of a rapidly evolving space is an imperfect exercise – we have done our best to be directionally correct, but we’re certainly open to feedback on how to make this chart better and more accurate. 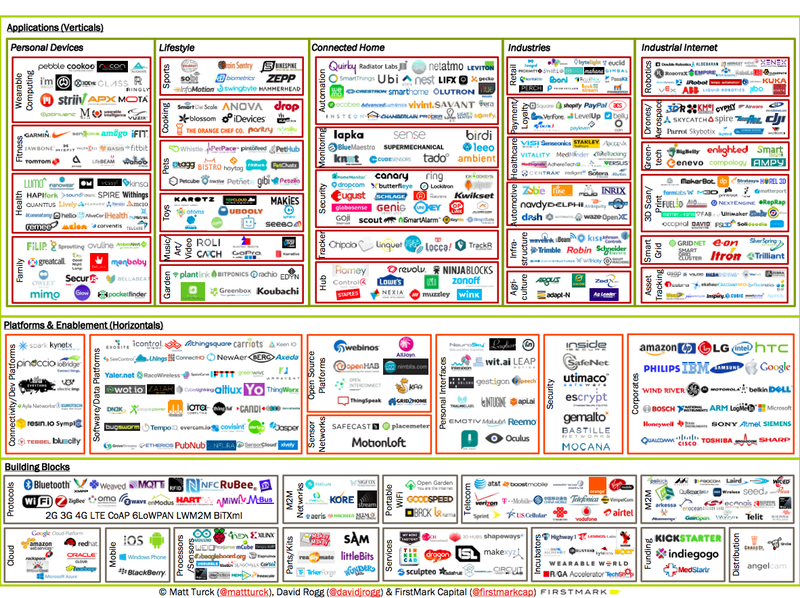 The chart, complete (with its cornucopia of logos) illustrates a few things about what’s been happening in the IoT space. With hardware incubators graduating legions of new entrepreneurs, crowdfunding in full swing and an increasing number of VCs excited about the space, new companies and products are popping up left and right. The previous version of this chart featured 199 companies – it now has 612 logos. I’ve written before about the connected home segment: Large companies have been active in this space or closely related spaces for a long time and are showing no interest in letting themselves get disrupted by small startups. This is true for industrial companies (GE, Siemens, Bosch, Philips, etc. ), as well as big tech (Cisco, Intel, Apple, Samsung, etc.). The increasing impact on the space by Google, a fairly recent entrant in the hardware category, will be a development to keep an eye on in the coming months. Since the first version of the chart 18 months ago, a number of promising startups have been acquired: Nest and Oculus, of course, but also others such as Basis, Dropcam, SmartThings, Revolv (acquired by Nest), etc. Partly as a result of this, it’s pretty striking that there are comparatively few mid- to late-stage startups in the IoT space. Innovation in the IoT space has been happening all around the world. Europe has been very active (Withings, Sigfox, Netatmo, Berg, and many others), as have other parts of the world (Australia with LIFX, etc.). The wearables market is probably getting close to its saturation point, at least for casual or consumer products (trackers, watches, etc.). Meanwhile, the connected home segment has seen large companies make aggressive moves through acquisitions, investments or product launches, and the opportunity to become the home’s central “hub” is quickly becoming a game for players with deep pockets. Innovation is accelerating at an incredible pace in a variety of segments, such as digital health (patient monitoring), “invisibles” (connected pills, connected contact lenses) and augmented reality, as well as around the enterprise and the industrial Internet (with technologies for asset tracking, energy management and machinery monitoring). Coupled with a push for smart cities, advancements in robotics, connected cars, aerials (drones, nanosatellites), and connectivity infrastructure the race for the internet of things space is just getting started. Just as certain verticals are nearing critical mass, new and innovative applications are being spun up and built out. In many ways, this is just the beginning. A lot can go wrong, but we’re all in for an exciting ride. This updated chart has been a team effort at FirstMark. Many thanks to David Rogg who handled the research and heavy lifting on the chart, as well as Caitlin Graham (logos), Dan Kozikowski (interactive version) and Sutian Dong (original version).